We first found mention of Wert Harlan and His Sun Rise Rangers when Nicola and Rose Fantetti mentioned him in their "Behind the Scenes" column in National Hillbilly News in November / December 1948. A few months later, they provided more details about Wert and his band. Wert and the Sun Rise Rangers started at radio station WHIO around 1945 or so and unlike some performer of that era, stayed with the station for a while. By 1949, they had celebrated their fourth anniversary with the station. Nicola and Rose note that the band played just about every type of venue back then, from the 'swankiest Country Club dances' to hoedowns in 'Rube Hayseed's barn'. 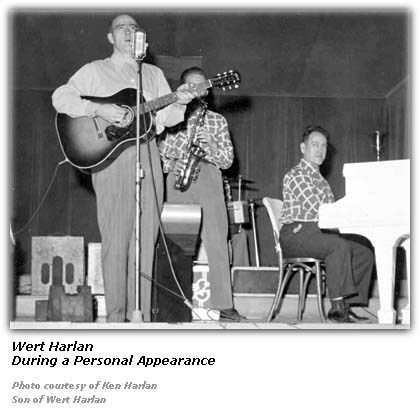 Around 1949, Wert's group consisted of Tommy Kerr, on guitar and vocals; Jimmie Moore on bass; Don WOoley, first violinist; Bob Bean, second violinist; and on accordion, April Jay. April was also known as a "gal Friday" for WHIO back then. Wert came into the world in Tompkinsville, Kentucky back in 1916. He was sixteen years old when he took to learning how to play the guitar. That led to him joining Cody Fox and His Yellow Jackets on radio station WPAD in Paducah, Kentucky. Wert first introduced himself to the listening audience at WHIO back in 1938. But he did roam around a bit before seemingly settling down at the station in the mid 1940s. It seems the country music artists of that era would often stop by to visit the various journalists when passing through a town nearby to a personal appearance or on the way home. Nicola and Rose Fantetti wrote of one such visit by Wert and his group as they stopped for a visit on the way home to Carrollton, Kentucky. It gave them an opportunity to mention the other Sun Rise Rangers. First mentioned was Tommy Kerr, born in 1914 in Campbellsville, Kentucky. Tommy first entertained radio audiences over WHAS in Louisville, Kentucky. He worked with Uncle Henry's Mountaineers for a time. 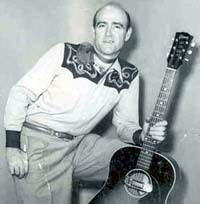 He later relocated to radio station WLAP in Lexington, Kentucky to work with a group called The Kentucky Ridgerunners. While there, he earned the title of Champion Yodeler of Kentucky. Eventually, he moved to WING in Dayton, Ohio for about two years. That led to his joining Wert Harlan's Sun Rise Rangers over WHIO. Nicola and Rose mentioned Tommy could play just about any stringed instrument and did well on the ballad numbers. The fiddler of the group at one time was Bob Bean, born in Eaton, Ohio in 1917. He also did some vocal harmony work when needed. Wert's group had another fiddle player back then, Don Wooley, born in Dayton in 1918. His favorite tune was Orange Blossom Special, but Wert said he really did best on Up Jumped the Devil. He also served Uncle Sam for four years as a radio-man on a Navy bomber. Jimmy Moore was the newest member of the group, a native of Bond, Kentucky, born 1915. He was the bass fiddle player and also served his country in the military service for four years. The last member of the group back then was a female singer by the name of April Jay. She was born in Dayton in 1922. Before she began her professional singing career, she worked for several years as music librarian at radio station WHIO. She did quite well for herself at the station, for she earned a promotion and transfer to WHIO-TV where she became the music director. In that era, Wert Harlan and the Sun Rise Rangers were on the air Mondays through Saturdays at 5:30am and again at 6:15am. During those nomadic times, he made appearances on such stations as WSM in Nashville, Tennessee and WLBJ in Bowling Green, Kentucky. His daughter Janie writes that for many years, he was part owner of the Stardust Dance Hall in the Dayton area. She fondly recalls spending many nights at the Stardust while she was growing up. She notes that the band played what they termed '50/50' - that is, half of the tunes were country music, the other half were square dance tunes. In her memories, the square dancing was unlike anything she had ever seen then or since. She thinks the caller, Johnny Guthlin, who was a World War II veteran, a flying ace, was quite extraordinary. Janie notes that her father remained acquaintances and friends with many of the headliners of that era - such names as Ferlin Husky, Ray Price, Eddy Arnold and so many more. Hoagie Carmichael was a good family friend as was the famed pop singer of the day, Rosemary Clooney and the entire Clooney family. He stayed at radio station WHUB in Cooksville, Tennessee for nearly a year. He had a show called "Memory Time". Wert's son, Ken, tells us that the theme song for the group was "She's the Sunshine of Moonshine Valley". The band would do the popular songs of the day in their personal appearances or radio shows, including such tunes as "Candy Kisses", "Signed, Sealed and Delivered", "Too-La-Loo-A-Roo-La", "Tumbling Tumbleweeds" and "Cool Water". On WHIO-FM, Wert Harlan and his Sun Rise Rangers were on Mondays through Thursdays at 5:15am and 6:15am as well as 6:45pm. On Saturday nights at 7:00pm, Wert and Tommy Kerr could be heard doing solos and duets as part of the "Out Doors with Karl Keller" show. It should be noted that Karl Keller was the Montgomery County Game Protector at that time. Wert continued to entertain the audiences in the Miami Valley of Ohio until he retired on New Years Eve in 1970. Carrying on in the "family tradition", Wert's grandaughter Kim Daniels is carrying on the tradition of her grandfather's legacy in radio through her show on KVMR-FM in Nevada City, California, playing folk, country and old time gospel tunes Sunday mornings on the Rise and Shine show. 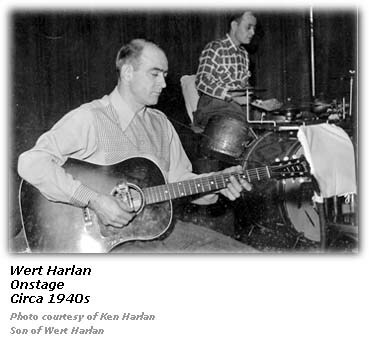 Hillbilly-Music.com wishes to express its appreciation to Ken Harlan, son of Wert Harlan for providing additional information about his father's career and photos as well as indicated. 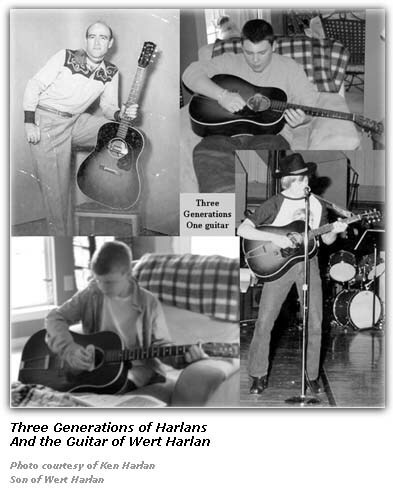 Hillbilly-Music.com wishes to express its appreciation to Janie (Harlan) Giliberto, daughter of Wert Harlan for providing additional information about her father's career.